Consider the plight of the Barbuda Warbler. A tiny puff of grey and gold feathers, the songbird is found only on its namesake island, where it sticks to dry, shrubby vegetation out of the way of encroaching human development. Its numbers range from 1,000 to 2,000 in the wild. It’s exactly the sort of species that can least afford to be hit by a hurricane—and the situation on Barbuda is now so dire that it’s not clear any are left. For the plants and animals of the Caribbean and Gulf Coast, it’s been a catastrophic hurricane season. On satellite imagery following Hurricane Irma, islands once green have been stripped bare. According to Nicole Angeli, Co-chair of the Caribbean Partners for Amphibian and Reptile Conservation, on some islands the smell of dead animals is thick in the breeze. Wetlands like Barbuda’s Codrington Lagoon were inundated with saltwater, and local conservation efforts for animals like the Anegada rock iguana damaged. The endangered Attwater’s prairie chicken south of Houston lost a huge chunk of its population post-Harvey; flamingo flocks in Cuba suffered horrific mortalities after Irma (content warning: that last image is rough). And in Puerto Rico, home of endangered species like the Puerto Rican Parrot and Golden Coqi frog, Hurricane Maria has devastated forests and agricultural land. As hurricanes get an extra intensity bump from climate change, they’re colliding with increased habitat loss and human development, and leaving threatened species at risk of being tipped over the edge. Seasonal big storms have always been part of the fabric of life in the Gulf of Mexico, and many local species have evolved strategies for coping with them. Some are resilient, taking cover in thick forests or bays to ride out a storm. Others recover quickly: As Angeli told Earther, One classic study found that adult populations of anole lizard could be entirely wiped off an island, only for buried eggs to eventually hatch a new crop of baby lizards. Hurricanes can clear the deck for a shuffling of species on an island, or give small animals a free lift to other islands or the mainland, giving them a chance at a wider distribution. But that’s the silver lining. According to Jeremy Ross, a conservation biologist at University of Oklahoma, high winds and floods knock down swathes of trees, destroy leaf litter and wipe out low-lying vegetation. Flash flooding can reshape rivers and marshes and blast entire populations of freshwater fish out of their streams and into the ocean, while storm surges ruin ponds with salt. Those animals that aren’t killed during the storm are often exhausted, their social groups splintered, and vulnerable to starvation or disease. The risk of predation by desperate humans—or feral dogs like those on currently abandoned on Barbuda—take a toll as well. 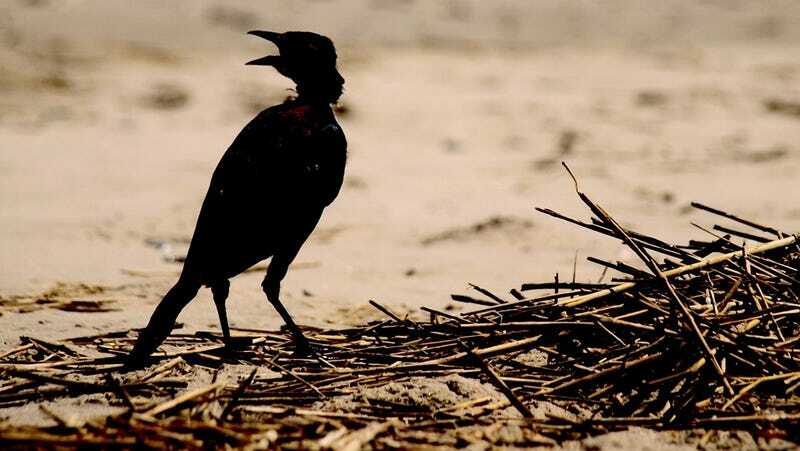 It’s not just small, delicate island animals that are at risk, either: large-bodied mainland species like Key deer, big cats, monkeys or flightless birds can have their populations knocked back by storms, and recovery can take a long time. Some—often specialist species battered by competition with invasive species or lost habitat—don’t make it through. Such was the likely fate of the the St. Kitts Bullfinch and Cozumel Thrasher, both of which disappeared after repeated hurricane strikes in the 20th century. While it isn’t entirely clear if extreme storms are becoming more common, there’s mounting evidence that they are getting more intense. One study found that Atlantic tropical storms reach Category 3 wind speeds around nine hours more quickly than they did 25 years ago, according to NASA’s Earth Observatory. Another found that extreme downpours happen 30% more often. As waters in the Gulf continue to warm, the chances of monster hurricanes like Irma—400 miles wide at its peak—are likely to go up. But focusing entirely on storms misses the larger threat most animals face, according to David Steen, a conservation biologist with Auburn University. A nature preserve in the middle of commercial development isn’t all that different from an island in a warming sea. Forests and marshes that have been fragmented or degraded by commercial and agricultural development tend to be a lot more vulnerable to storm damage than uninterrupted habitat, Ross said. Even large, relatively intact areas like the Everglades—which serve as the last line of refuge for many animals—can actually leave species directly in the line of fire. A nature preserve in the middle of commercial development isn’t all that different from an island in a warming sea. And islanders—human and animal both—are at greater risk from climate change because they often have nowhere to go. All it takes is one unlucky disaster to get the extinction ball rolling. The way to stop that from happening, Steen said, is to invest more heavily in protecting wild and intact landscapes. Ross also suggested environmental engineering projects like the creation of barrier islands, marsh buffers, and habitat corridors to help animals move around and shelter from storms. (This will take understanding which habitats animals use to go to ground, which often aren’t the same ones they live in normally. People don’t normally live in storm shelters, after all, but they still need them available.) Then there’s the way we design our cities; as has been widely noted, Houston’s endless devouring of coastal prairie made its hurricane-created floods much worse. Asher Elbein is a journalist and short fiction writer from Austin. His website is asherelbein.com and you can find him on Twitter @asher_elbein.